My aunt visited Jersey recently, and I spent a lovely afternoon with her at the orchid greenhouse in Trinity. This is such a treat if you love flowers. Orchids are known as the royal family of plants - and the sheer variety of types of orchids on show amazed me. I was expecting the orchid greenhouse to be warm, but is was a pleasantly cool temperature. The orchid show is made to look as natural as possible, with a background of other plants to set off the orchids. Some show orchids stay permanently in the display house, others move in and out. 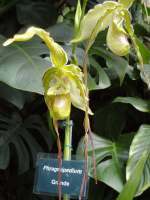 There are some huge specimens of species orchids, bigger than you would find in the wild, some growing to 6-8 feet across. In the orchid greenhouse you can see many types of species orchids including Phalaenopsis (moth orchids), Cymbidiums , Phragmipediums (Mandarin orchids), Miltonias (pansy orchids),Sobralias, Dendrochilums (chain orchids), Paphiopedilums (slipper orchids), Cattleyas and Odontoglossums, as well as many of the hybrids bred by the foundation. Labelling is discrete and uses only Latin names, but the staff are very helpful and happy to answer questions from visitors. Midday on sunny day is a good time to experience orchid perfumes. Perfume's are often released only at certain time of day to attract particular insects. Most smell sweet, a few smell bad to attract flies! Finding the orchid greenhouse is a bit tricky. It's tucked away in a corner of Trinity, off the main roads. I guess even a lot of local people don't know it's there. The easiest way to find the Eric Young Orchid Foundation is to follow either the A7 or A8 roads from the St Helier ring road. Look for signs to Victoria Village, then follow the orchid foundation signs. The only bus to Victoria Village is the No 21. It's very infrequent so check out the times before you set off! 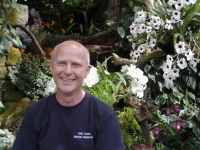 We chatted to Chris who works at the orchid foundation. He told us that there is no bad time of year to visit, as there are orchids in flower all year round. Winter is best to see the cymbidiums in flower, but in summer, the range of types of orchids in the display house is much more diverse. 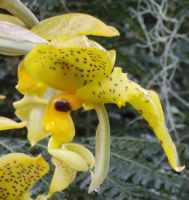 They specialise in creating new hybrids of the horticulturally important orchids. Most new hybrids are named after Jersey places. The quality of the orchid breeding here is known throughout the world, and the Eric Young Foundation have won many top awards including at Chelsea. Orchid enthusiasts visit from all over the world. 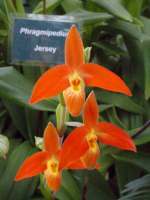 If you're interested in orchids, find out about wild orchids in Jersey here. I was surprised by the Chain orchid Dendrofiliforme, which I wouldn't have recognised as an orchid at all! But the one that really caught my eye was the Stanhopea orchid which mimics an insect. Orchid breeding is a very specialist area. Chris likens it to breeding racehorses, and much of the work done at the foundation is highly technical. Once out of the display house you can get a glimpse of where the real work happens, by walking along the glass bridge above the greenhouses where the breeding takes place. 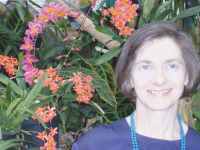 Allow at least an hour to visit the orchid greenhouse, much more if you are a real orchid enthusiast - many spend a whole day here, and there is more than first meets the eye. The gardens are being developed so that visitors have outdoor space to enjoy, and maybe to sit and eat a packed lunch. The orchid foundation is not designed to be primarily a tourist attraction, so has few facilities. The is no café, and no food shops or tearooms nearby. Although you can get a cup of tea or coffee, you might want to bring a packed lunch and sit in the gardens, or plan to go on to somewhere else to eat. 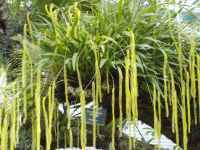 The Eric Young Orchid Foundation is open all year round, but not every day of the week. You can check their website for opening times and admission costs.